I've lifted pictures of this beautiful woman from Ari Seth Cohen's Advanced Style before. She looks even more fabulous in his latest post. Here are her life and style tips. By the way, she's 100. 1. "I never go to bed with my makeup on. that is number one.At night you must let your skin breathe." 2. "I use a lipstick brush to paint on my lipstick--It stays on longer that way. I can also use a lipstick longer than anyone else because I can dig into it." 3. "Every night before I got to bed I use Elizabeth Arden's 8 hour beauty cream on my lips. You must keep your lips moisturized." 4. "When it comes to fashion you must be aware of your skin tone. You don't wear orange lipstick with a red dress." 5. "I make myself go out everyday, even if its only to walk around the block. The Key to staying young is to keep moving. You are never too old to exercise." 6. "Invest in Quality pieces, they never go out of style." 7. "Don't look at the calendar, just keep celebrating everyday." 8. "I dress up everyday and I don't wear blue jeans. 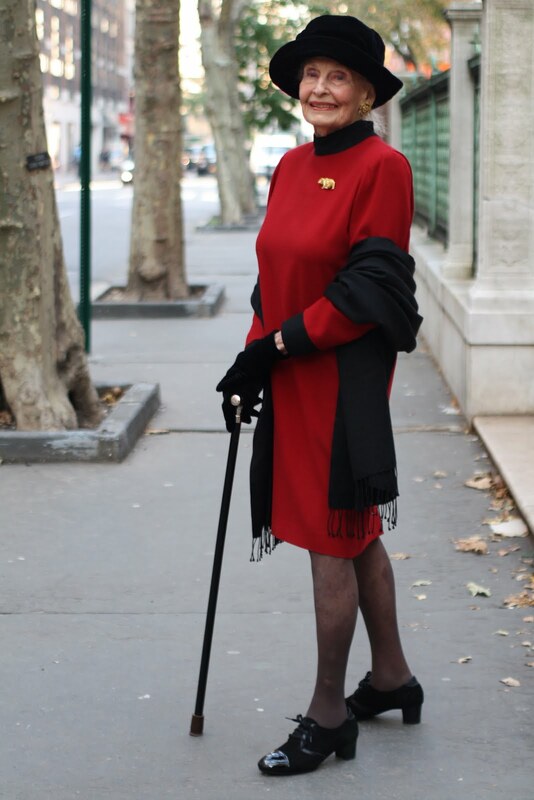 I dress up even to mail a letter, you never know who you will meet along the way." 9.I have been active my whole life. An old Elizabeth Arden Ad said,"If you want to look like this when you are 40 start when you are 20." 10.I wake up every morning and say, "This is the day the lord has made." Inspiring stuff, even for blokes. Thanks, Anon (if I may call you that) - I'm glad. And if you come across any images of well-dressed older men, do let me know.